LOS ANGELES, May 3, 2017 — (PRNewswire) — In collaboration with The Los Angeles and Orange County Audio Society, the Los Angeles Audio Show (LAAS) welcomes the Japanese giant, Sony Electronics, to join the show's exhibitors. Sony Electronics is at the forefront of technology innovation and entertainment and will be located in the Hermosa Ballroom with participation crossing six of LAAS' activity categories including Private Listening Rooms, Dolby Atmos® Cinema, and Car Audio. Sony Electronics will be highlighting some key high performance audio products for attendees to experience the power of Sony's audio technology firsthand and in real world experiences. Products such as the new STR-DN1080 Audio Video Receiver, flagship HT-ST5000 sound bar, and premium Signature Series MDR-Z1R headphones and NW-WM1A & NW-WM1Z Walkmans® will be shown. Sony will also be sponsoring a Magic Bus appearance outside with an exclusive live performance from Fiona Joy, showcasing the beauty and importance of hi-res audio. "Sony Electronics is pleased to be a part of Los Angeles' first premier consumer audio show," shares Yukio Ishikawa, Director of Product Marketing for Home Audio and Video, Sony Electronics. "The LAAS sets a great environment for world class manufacturers and dealers to congregate and enjoy high-end audio." Attendees can expect to experience high quality audio/video concert and movie content through Dolby Atmos home theater display, HT-ST5000 sound bar set up and STR-DN1080 AVR environment. Fans can also explore pure music experiences, the way the artist intended it, through home and mobile audio devices such as MDR-1000X noise canceling headphones, PS-HX500 vinyl turntable, and hi-res Signature Series. In addition, Sony's impressive line of ES series speakers and audio video receivers will be in attendance to amplify and demonstrate high-end audio as well as create the ultimate theater experience for attendees. Building on the experience, Sony will be featuring one of their 4K SXRD home theater projectors, the VPL-VW675ES, as well as Sony's stunning 4K HDR LED TV XBR-Z9D. In order to enhance their capabilities, Sony's first UBP-X800 4K HDR Blu-ray player and RSX-GS9 Hi-Res Audio Media Receiver will both make an appearance. The Signature Series features the premier MDR-Z1R headphones optimized for hi-res personal listening enjoyment. The headphones utilize a 70mm, magnesium dome HD driver for the widest frequency response (up to 120kHZ) possible; along with a lightweight aluminum coated LCP edge diaphragm, and a powerful neodymium magnet, ensuring greater velocity, less signal loss and more natural sound. A highlight of the Signature Series is the new flagship NW-WM1Z Walkman®, which features an entirely new, gold-plated, oxygen-free, copper chassis to help reduce contact resistance and oxidation while minimizing magnetic interference. It incorporates a dual clock circuit with low phase noise quartz oscillator, which achieves superior sound reproduction at virtually any volume setting. To further reduce noise, both the WM1Z and WM1A utilize separate analog and digital circuitry as well. The MDR-1000X is the flagship of Sony's noise canceling headphones lineup. A number of advancements have been put into these headphones to make them industry-leading, such as the signal processing to pursue the best noise canceling performance with upgraded filtering process, optimized dual noise sensor technology, and newly developed ear pads. Thanks to these advancements, MDR-1000X provides a secure noise isolation and listeners can immerse themselves in the music without any distractions or simply enjoy the silence. In addition, a personal NC optimizer tailors the noise canceling performance for the individual ears. The headphones analyze the shape of their head and their wearing style (such as hair style and wearing glasses or not), providing a customized noise-canceling experience. This personalized listening experience is realized by the newly developed SENSE ENGINE™. Sony's new flagship 7.1.2ch 800W sound bar features Dolby Atmos, Hi-Res Audio and twelve advanced speakers – all in a sleek, stylish design. Each speaker unit utilizes separate drivers to reproduce a full range of sound that supports High-Resolution Audio playback. 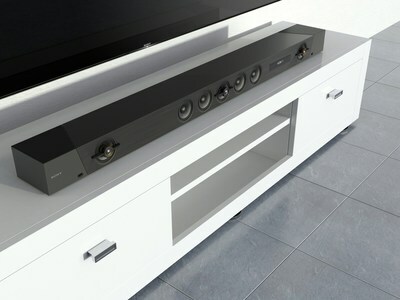 While a powerful addition to a television or projector all on its own, this sound bar is designed to be the cornerstone of a home theater setup. With three HDMI inputs, one HDMI ARC output, a USB input, Bluetooth, NFC, as well as digital optical and analog connections, there's a connection for all your equipment. The ST5000 maintains quality from source to screen with support for 4K and HDR content from major studios via HDMI HDCP 2.2. Building on Sony's fundamental amplifier design methodology, the STR-DN1080 Object Audio Compatible HiFi AV Receiver offers improved sound quality, flexible speaker solutions, and support for the latest audio formats such as Dolby Atmos and DTS:X®. By combining Sony's "Phantom Surround Back" technology, you can enjoy 7.1.2ch speaker configuration with actual speaker setting with 5.1.2ch. The receiver also supports a long list of legacy surround formats, including Dolby TrueHD and DTS-HD Master Audio. Headquartered in San Diego, Sony Electronics is a leading provider of audio/video electronics and information technology products for the consumer and professional markets. Operations include research and development, engineering, sales, marketing, distribution and customer service. By focusing on engineering and a passion to inspire, Sony is creating world-leading products that innovate and inspire generations, such as the iconic PlayStation, the award-winning Alpha Interchangeable Lens Cameras and revolutionary high-resolution audio products. Sony is also a leading manufacturer of end-to-end solutions from 4K professional broadcast and A/V equipment to the marketing leading 4K Ultra HD TVs. For more information on Sony at the LA Audio Show visit www.laaudioshow.com. SENSE ENGINE is an integrated technology of Sony's unique audio signal processing and analyzing techniques. This technology provides an individualized experience for every single sound, including music and ambient sound, tailored to each user's preferences. SENSE ENGINE is a trademark of Sony Corporation.